Many people rely and trust our original Irritable balm so we would not want to stop making it for them. We would surely be in a lot of trouble if we changed it. However, we have kept researching how to further improve our formulas and have created this cream to include additional ingredients such as Raw Coconut Oil, Bisabolol and Elderberry Extract, without the inclusion of Colloidal Oatmeal. Our original cream has been very popular for many years and this is designed as an alternative version. Aloe Vera Juice Concentrate If you haven't heard of the benefits of Aloe Vera on skin soothing than you must be new to all of this. Aloe is a beautiful plant that brings relief to inflamed skin. In order to get all the benefits of Aloe when there is only so much room in our cream, we have use a very concentrated form of the juice. Bisabolol (German Chamomile Essential Oil) We love German Chamomile for soothing irritated skin. We have used it in the original Eczema Balm for years. The problem we have is that we have more actives in our new Eczema Balm, so there is less room. We could just add a token amount, but we feel our cream really needs a lot to be most effective. To solve this problem we are using Bisabolol which is the concentrated form of German Chamomile. A bit more expensive, but worth it. Sweet Almond Oil Sweet Almond Oil is one of the best oils to calm skin due to its fatty acid profile. Incidentally, people and children with nut allergies are usually allergic to the protein in some nuts, not the oils. So Sweet Almond Oil should be fine for people with allergies. However we do also have the Nut Oil Free Soothing Cream. (All natural products should be patch tested for allergies of course). Piroctone Olamine It is very important creams for broken skin are properly preserved. Piroctone Olamine has an anti-yeast and anti-bacterial property for the cream so we use this ingredient to keep the cream stable so as not to infect broken skin. Allantoin Comfrey has long been associated with soft, healthy skin. Allantoin is a skin conditioner that has been purified from comfrey. Allantoin is thought to help maintain healthy skin by encouraging the removal of dead skin cells. it is also promoted for preventing lines and wrinkles by assisting in skin repair. Hops Extract (Humulus Lupulus Extract) As you can see from the rest of our ingredients, we try and use edible ingredients whereever we can. This is one of our innovations. (Note: Hops are not alcoholic. They are used to make beer, but they are not fermented in our creams but the fresh extract). I just wanted to drop you a quick but heartfelt thank you for your wonderful product Moogoo Eczema and Psoriasis Balm. I have always been blessed with good skin but the last 4 years I have suffered terribly with Psoriasis all around my eyes. I have tried MANY products with no success and rely on cortisone cream and sticky heavy-duty moisturiser. Last weekend I was in so much pain and itching with my eyelids bleeding and the surrounding area looking like alligator skin and plaguing and flaking that I got up in the middle of the night and went driving for a 24 hour chemist. I found one but they didn't stock the cream that I had been researching to try next. They did, however stock Moogoo. The assistant assured me that she had been hearing of really good results with this brand. I was very skeptical but as the price was so reasonable I thought it was better than nothing. Just wanted to let you know that I have had a real problem with eczema for about 10 years. I About 3 months ago I asked a local chemist to recommend an every day moisturiser that simply wouldn't exacerbate the problem and they put me onto your eczema balm and your every day moisturiser. I have had no recurrence since regularly using your products. This is very exciting! Hello Moogoo. Thank you so much for the recent order you sent me. My son has suffered from eczema since he was 6 months old and at nearly 4 has never slept a full night due to all the itching. Your company was recommended to us by family who live in Melbourne and boy am I glad they did. Jake actually slept last night for the first time!!!!!! His skin is comfortable and he loves the eczema balm which you sent to me as a sample, I have just ordered lots and lots of it. Once again thankyou, thankyou. I just wanted to let you know how great your products are, which I know you already know! My mother underwent treatment earlier this year and I gave her several of your products to help maintain skin integrity and moisturisation. I gave her the face cream with resveratrol, the full cream skin cream and the tingling honey lip balm. The lip balm totally prevented the usual and cracking often experienced with the particular she was on. (Slight soreness was experienced occasionally, but no cracking!) As well, the rest of her skin integrity was maintained. She has made a full recovery thankfully, and remains a MooGoo convert. In fact, her skin glows with health and moogoo! Also my teenage daughter began to develop acne so I purchased your anti acne face wash. It has been wonderful. Within a , no more pimples! She was ecstatic and uses it religiously every evening. Thank you for a great product line. Thankyou for your message and yes you have answered my email and sent samples which I received gratefully and so have many of my patients. The chemist next door to our practice has now stocked the products and all of my patients are buying them and all have never felt better. I have a 16 year old girl who had eczema and for all her life her mother has tried one product after another and the girl put up with itching, bleeding and infection at times, she became isolated and dropped out of school because of stress and bullying because of her condition. Her mother came in this week with her daughter who for the first time is free of itch and the angry rash and has only some pale pink marks on her skin. She is glowing and happy and her mother could not thank me and hug me enough- tears and many tears have been shed in happiness. So I send the hugs to you. This is only one story of many happy patients and the chemist is having to make bigger orders to keep up with the demand. My baby son Zane has suffered from eczema since he was around 8 weeks old. He is 9 months old now and we have finally discovered Moogoo! 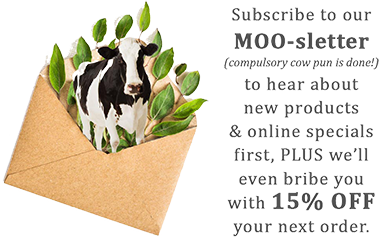 We've tried so many other organic products but Moogoo is our solution! I've just received my second order of the eczema and psoriasis cream and msm smoothing cream. I've been using both products on his skin 3-4 times per day and we finally have the eczema under control. Thank you for such a great product! Zane loves it too... He attacked the container while I was getting his dinner ready. I've attached the photo so you can see for yourself, it certainly made us all laugh at home. I'm so sorry for only getting back to you now. I just wanted to let you know that we have had great success using the moogoo products on my childrens eczema! My 2yo sons no signs that he evehas improveded and his was quite bad, particularly behind his knees and around his ankles. My daughter's is still dry looking around her face, but she tends to forget to put the creams on, but the redness is gone, which is a huge improvement for her.I am so happy to have found that my local chemist stocks a lot of your products, so I bought some more of them from there. IThankyou again for sending on the samples, I really appreciate it, and I will continue to use your products for my children, as they haven't reacted to them at all. I actually just wanted to say that I have suffered from very dry skin especially on my face and head and I started using the Moo Goo shampoo and conditioner and it cleared my dry skin in a couple of washes. I recently ran out and had forgotten to get more and I used a normal shampoo and within a couple of days my dry scalp was back. Ive actually recommended Moo Goo to lots of people because it has done such a fantastic job for super sensitive skin. Im also really excited to see the skin care range. Im quite allergic to normal skin care products and havnt used any for about 3 months so when I go to buy my shampoo I will also be buying the skin care products. Thanks again for such great products. For over 10 years my husband Terry has suffered from scalp problems, which was both embarrassing and very itchy. We received our first order a few days ago of Eczema and Psoriasis Balm which Terry used immediately. No itching, redness or unsightly 'snow storm' on his collar. He is also using the Milk Shampoo and his hair feels wonderful. I decided to try the shampoo this morning and my scalp felt soothed and my hair, healthy.